Established in 1967, the Ghost River Wilderness Area, located along the eastern slopes of the Rocky Mountains in southern Alberta, is one of only three provincially designated wilderness areas in the province. As such, it is supposed to have the strictest form of government protection available in Canada, with development, motorized transportation and recreational activities either tightly controlled or altogether forbidden. 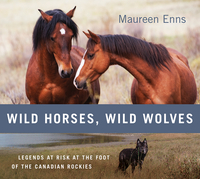 This has not been the case, however.It is in this beautiful, threatened and geographically remote area that Maureen Enns, a well-known artist, author, educator and conservationist, has come to discover an incredible world inhabited by wild horses, one of the region’s most elusive and iconic creatures. Descendants of the original settlers of the area have been known to describe the “wildies” of the Ghost Wilderness as ugly, nondescript, Roman-nosed and useless animals. But such descriptions stand in sharp contrast to some of the athletic and beautiful stallions, mares and foals that Enns has encountered. Using a stunning combination of drawn and painted images, conventional and remote photography (using hidden cameras activated by heat or motion) and traditional stories told by Peigan and Stoney Nakoda people, Enns invites the reader to join her as she untangles old myths regarding Alberta’s heritage and reveals some uncomfortable realities facing the province in the 21st century. The wild horses, wolves, moose, deer and bear profiled in this book have had little contact with humankind. As communities, developers and governments struggle to understand the impacts of conservation, recreation and development in sacred places, it is becoming more and more difficult to keep the “wild” in wild animals. This project is passionate plea for understanding, conservation and action. Maureen Ennsis an internationally renowned artist, educator, conservationist and co-author of Grizzly Heart: Living without Fear among the Brown Bears of Kamchatka, Grizzly Kingdom: An Artist’s Encounter and Grizzly Seasons: Life with the Brown Bears of Kamchatka. She is well known for her groundbreaking, experimental research concerning human co-existence with grizzly bears in Russia’s Far East and has been the subject of numerous TV documentaries, including Games End (1990), Grizzly Kingdom (1993), Walking With Giants (2001) and Wild Horses of the Canadian Rockies (2007). Born in British Columbia, Maureen lives in Banff, Alberta, with her partner, Rick Kunelius. Her studio is located along the Ghost River. Please visit maureenennsstudioltd.com.